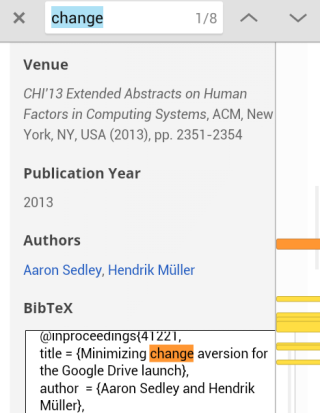 Chrome for Android has a "find in page" icon that's easy to miss. When you type some keywords in the omnibox, you can tap the icon highlighted in the screenshot below to find the matches from the currently loaded page. If you tap to the left of the icon, you'll search the web. When you tap the "find in page" icon, you'll see the same interface that's available when you use the "find in page" feature from the Chrome menu. Use the up/down arrows to see the next/previous match, tap the yellow bars from the scrollbar to go to one of the matches or use the special "find in page" scrollbar. 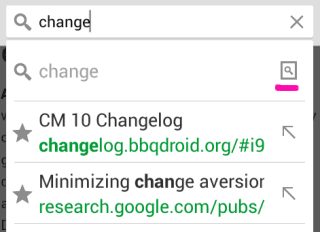 Even if you close the find bar, you can easily open it again from Chrome's menu. The nice thing is that Chrome remembers your keywords and the current match.